We’re all looking for good board members, but why should they join? In her “On Doing Local History” column, Carol Kammen discusses the board recruitment process looking from the outside in. An excerpt from historian Joseph Amato’s essay on the importance of local places and the need to fight against the national and global forces that threaten to dilute them. Leslie Bowman, president of the Thomas Jefferson Foundation, describes their recent efforts to make Monticello sustainable and engaging. Kathleen Barker recounts the efforts at the Massachusetts Historical Society to interpret 200 years of Boston’s history through music. Jay Vogt highlights an award-winning exhibit on a USO canteen in South Dakota, including a recipe for the pheasant sandwiches served there in the 1940s. The issue closes with Laura Roberts’ book review of Reinventing the Museum: the Evolving Conversation on the Paradigm Shift by Gail Anderson. She gives it a thumbs up: “some of the most significant and illuminating essays from the last decade”. A bonus! Tucked inside is a technical leaflet on interpretive planning by Stephen Hague, which is based on the excellent interpretive plan for Stenton. 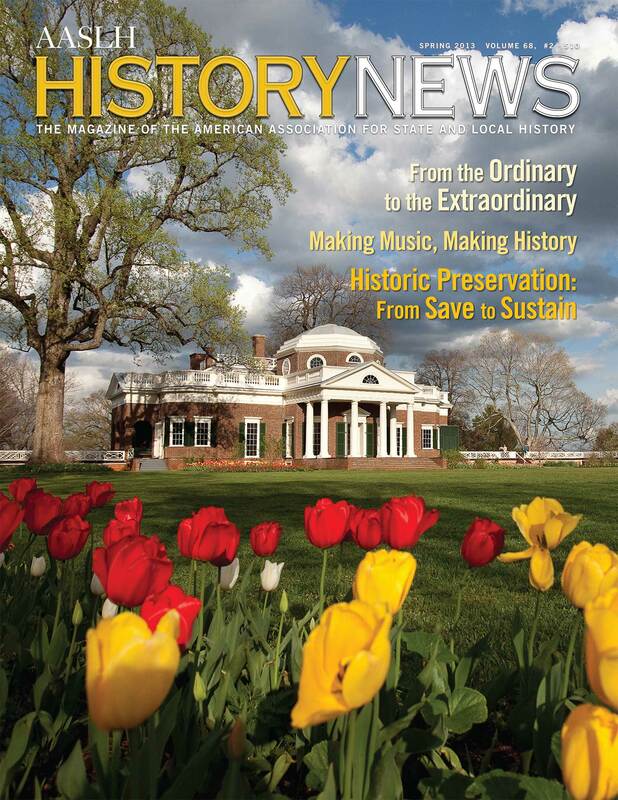 History News is one of the best benefits of AASLH membership and ideal for staff, volunteers, and board members who work at history museums or historic sites. If you haven’t already joined, you’re overlooking an excellent resource (I’ve been a member for more than 35 years!). Thanks! I’m glad you found it helpful so quickly. Max, thanks for sharing this. As editor getting a magazine out is such an effort that I rarely get to stop and reflect on the content.